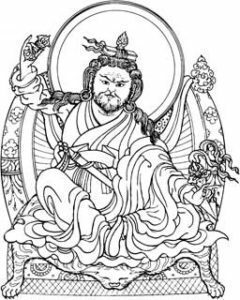 Dudjom Lingpa (1835-1904) was a Tibetan meditation master, visionary, tertön of the Nyingma tradition of Tibetan Buddhism and a Dzogchen master of principal importance (particularly in the area of “refining perception”) at his time. He receive direct transmissions (nye brgyud) of the mindstream or “heart-mind transmission” (thugs brgyud) of a number of lineage holders such as Sri Singha, Saraha, Vajradhara and Manjusri. Dudjom Tersar is the collective name for the large collection of terma teachings revealed by Dudjom Lingpa and Dudjom Rinpoche. As a class of texts, Tersar (gter gsar) means “new or recently-revealed treasure teachings”. Dudjom Rinpoche was a major tertön (gter ston) or revealer of hidden teachings. This text presents the view of the Great Perfection through the approach known as trekchö (cutting through solidity). Buddhahood Without Meditation is widely known by its subtitle, Nang-jang (Refining Apparent Phenomena). This second, revised edition is the result of a thorough re-examination of the original English translation done in an effort to clarify the terminology and meaning of Dudjom Lingpa’s text for Western students of the Great Perfection.